Medical health care – Förderverein Sani-Zanskar e.V. Tibetan medicine has its roots in the old traditions of Indian and Chinese medicine and has further differentiated and developed these traditions. The Amchis, that’s how the physicians in the Himalayas call themselves, treat their patients usually for free. They collect their herbs in the mountains and carry out their own farming. More and more this traditional, very efficient and gentle form of medicine is replaced by western medicine. In cooperation with the Nima Odser Sorig Foundation we have built a hospital ward in Sani. 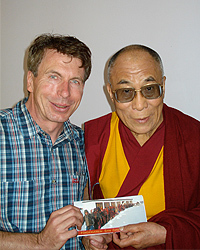 There Tibetan medicine is practised and taught and a constructive exchange with Western medicine is planned. A place where physicians can learn from each other for the benefit of their patients. Physicians visiting our hospital work there at eye level with the Amchis. Quality assurance of our joint work is guaranteed by our patient files. The Amchis reinforce their local position by participating in trainings in areas such as dental medicine and ophthalmology or hearing aids. Our work is to be seen as a useful complement to traditional healing and supports sustainability of our project. In July 2009 a German dentist held a training in basic diagnostics and therapy of dental diseases. There the Amchis learned to make their own small fillings and to pull teeth. An ophthalmologist together with a young female physician has also examined the people in July 2009 and created patient files. For several weeks a very dedicated ENT specialist has practiced in our hospital. In his luggage he had 10 hearing aids which could for the first time ever prove their functional efficiency at a height of 4000 m.
As he usually does once a year, the president of our association, Rainer Lezius, has visited the village and hospital and made sure everything is ok. In his function as a physician, he talked with the Amchis about the things achieved so far and made plans for the further use of the hospital. In Zanskar people are traditionally looked after by physicians familiar with the Tibetan medicine. These doctors are called Amchis and they collect their own medicinal herbs in the mountains and create the necessary medicines from these herbs. Tibetan medicine is very efficient, in particular when it comes to chronic diseases. They are sometimes far better than western medicine. Western medicine was introduced to Ladakh and Zanskar after the opening of the region. In the fields of accident surgery, odontology, ophthalmology and ENT medicine, i.e. in areas where technical aids or organ replacement is necessary, western medicine may be used additionally. During Summer people have the opportunity to go to the hospital in Padum or drive to Leh or Srinagar. I could tell horrible stories from my 14 years of experience regarding these hospitals, but it seems like things are improving finally. Our project is aimed at strengthening traditional medicine and traditions which have kept these people in a sound condition for many years – psychically and physically. We have planned to install a mobile dental unit in our hospital (Mentsekhang) this year and train the Amchis in its proper use so they have access to dental emergency aids during the five months when they are usually snowed in. What is far more important, however, than material aid provided, we need to make the people aware of the fact that actually we need to learn from them and not the other way around. Our society is suffering more than ever from psychosomatic diseases, but when it comes to being sick we might reduce everything more or less to one great deficit or dilemma and in this regard we can learn a lot from Ladakh and Zanskar. The question “what’s wrong with you?”, which once upon a time we heard on a daily basis, needs to be asked again. We who live in a so-called modern society, have completely forgotten what it means to be a human being, we do not know anymore what to do without those modern media. On the one hand, this is due to the fact that village communities have practically ceased to exist, and on the other hand a society subsists where people are being more and more isolated and a differentiation is made between old and young people. Our Mentsekhang (traditional Tibetan hospital) was used in the past three years as a winter school for children and was visited by German specialist physicians offering their expertise during Summer. This arrangement was to the benefit of the whole valley. The ophthalmologist carried out mass examinations in several schools and the ENT physician handed out hearing aids to 10 patients. In 2010 our dentist project will be spurred on and a German dentist will train the Amchis in using the dental unit. Strengthening of traditions will and must always be our main concern. Owing to this, we quite welcome the fact that the treasurer of our local partner organization, i.e. the “Nima Odser Sorig Foundation” has married a woman who is a Tibetan physician. She has completed her Amchi certificate in Dharamsala at the school of the Dalai Lama. She is to take over our Mentsekhang and assure and promote preservation of Tibetan medicine. We want to support her in every possible way.